I’ve been neglectful of the tomato patch and it has got out of control. I’m too ashamed to show a photo of it! I didn’t do a proper job on the staking and when tomatoes get riper they get heavier and need strong support. My efforts to put things right yesterday were comical, and I decided to let them go their ways and be grateful for what they offer. I apologised and promised I’d do better by them next year! Mother Nature’s been in a forgiving mood and the yield has been sweet and generous so far. I collected enough ripe tomatoes to make this salad. It’s based on the wonderful Riverford Farm Cook Book with some rocket added. Heat a griddle to hot. Warm the beans through in a little water. Drain and moisten them with a tablespoon of olive oil. Add them to a large bowl in which you are going to mix the salad. 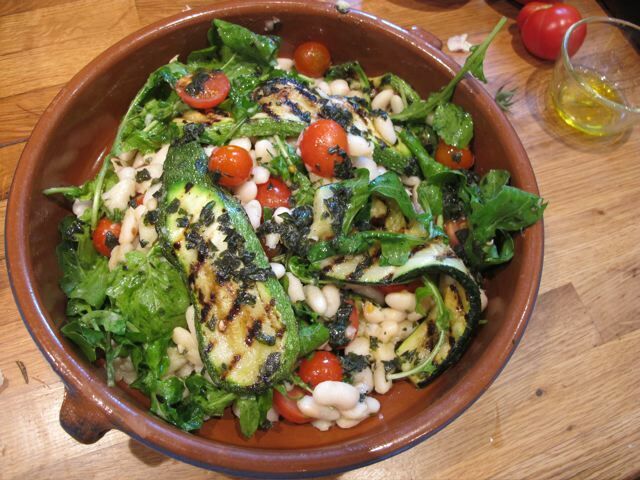 Brush the courgettes with oil and grill them on both sides until tender and nicely charred. 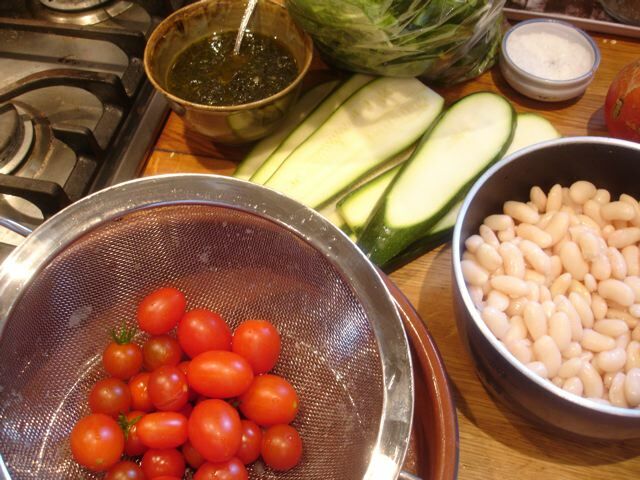 Add the cherry tomatoes–halved if they are on the large side. Combine the basil, garlic, a pinch of salt and the olive oil in a food mixer and whizz. Add this to the salad and turn it over carefully. Lay the rocket in a wide bowl and gently empty the mixed salad into it, and turn the salad again. You can serve this tepid or at room temperature. Lovely, Laura–thanks I’ll take a look. The picture of the finished salad looks great but I wish I knew what rocket is, I would like to try it. here is wikipedia’s definition, Louise. t is usually available these days in supermarkets.